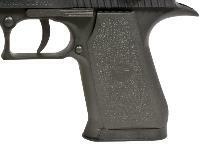 Talk about filling your hand...this pistol is big! That's because it looks and feels like the firearm. 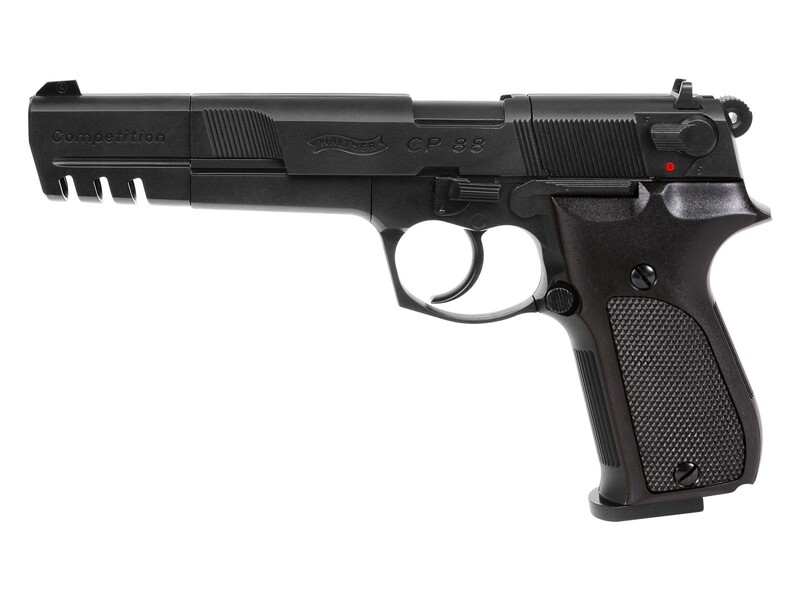 It's spectacular shootin' fun and delivers hours of plinking pleasure for the whole family. Things I liked: This thing is a BEAST! Even though it's poly it's got some serious heft to it and, at least to me, it doesn't look like a cheap toy. The grip is best suited for an NBA player but I managed to get my average sized paws around it well enough to squeeze the trigger comfortably. At 21 feet it hit the target like a hammer. 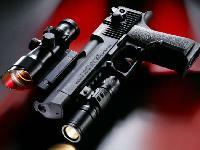 I was completely taken aback by the force this gun has. Things I would have changed: Honestly there's very little. 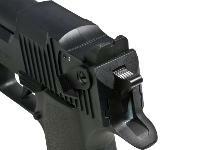 Of course I'd like an all metal version, or one where the slide locks back after the last round - the usual. Truth be told, I'd be thrilled if it simply held a few more rounds as I find I spend nearly as much time loading as shooting and 8 rounds go fast. 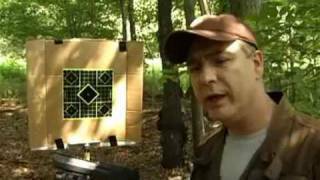 What others should know: I can't comment on accuracy with the integral sights as I slapped a laser on my gun the minute I felt how heavy it was. It dialed in quickly and became an instant favorite. One tidbit though, make sure you tighten the CO2 screw all the way. I stopped immediately upon feeling back pressure and failed to pierce the cartridge. An extra turn and a half and all was well. Things I liked: This item turned out to be a real surprise. 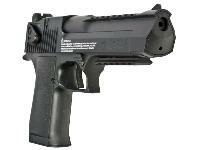 I own 25 CO2 air pistols and generally buy based on the advertised specs. In many cases I have been disappointed with performance. 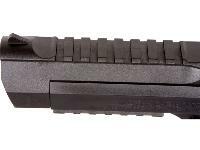 I have generally found that the advertised velocity of CO2 pistols is not the average velocity but turns out to be the high velocity. Not this time. 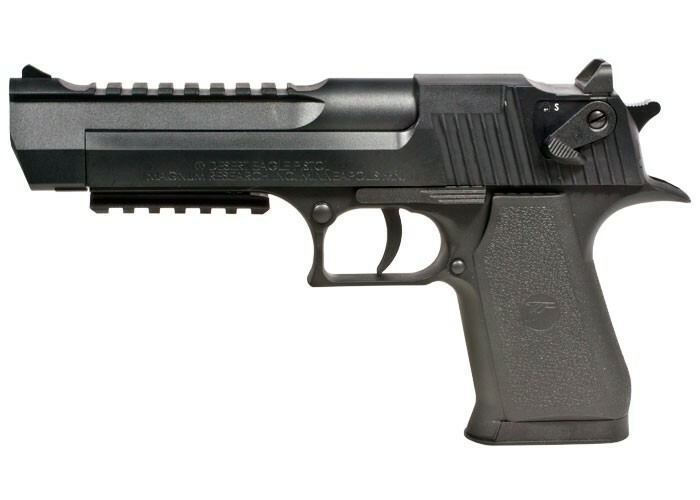 The Magnum Research Desert Eagle delivers as advertised. Having just put four clips through the DE, here are my Chrony results: Pros: Exceeds velocity specs, very powerfull shooter. High accuracy. I like the CO2 chamber screw seal. I normally have trouble getting this type of screw cap started but this one is level and starts threading easily. Kudos to the designer. Things I would have changed: Cons: The only compaint I have is that the front sight is too slim. 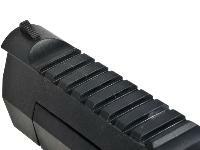 I like a front sight that fills the rear sight notch. What others should know: My Chrony tests showed better than advertised performance: Advertised Velocity: 426 fps. 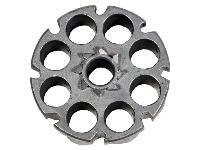 I was using Crossman 7.4 grain Wadcutter Pellets. High Velocity: 458.5 fps Low Velocity: 421.1 fps Median Velocity: 438.0 fps Mean Velocity: 436.89 fps Range: 37.4 Standard Deviation: 10.69 All shots out of four magazines used in testing registered over the 400 fps velocity mark - even to the last pellet in the 4th clip used. The advertised high accuracy also proved to be true. I was able to put a 3/4 inch hole in a 1 inch target center after 32 shots. 12 shots registered in the 2-1/2 inch black amd 20 shots registered in the 1 inch center bullseye. No discernable cracks in the blowback slider. Cracks have been reported by others but none were detected by me. The plastic construction does not degrade performance and enjoyment in any way for me. This is a quality item. 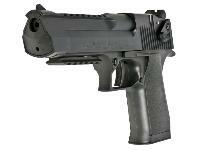 If you enjoy CO2 shooting, the Desert Eagle delivers. Rating A+++++ 5 Stars. Things I liked: I had to put off buying one for a long time thanks to Michigan, but things changed and a whole new world of airguns was open to me. 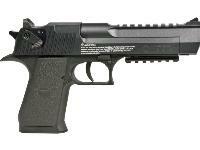 But even then I resisted the Desert Eagle because I normally don't like plastic guns. But I just got one today. So I am passing judgement on it. The gun is big. I have big hands which it really does fill up. If you have small Donald Trump hands this might be a bit too much to hold. It has a nice heft to it, trigger is a bit creepy but it's light. 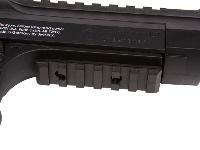 It hakes several inches of pulling on that trigger to get to where it needs to be to fire. The recoil is there but nowhere near what the real one does. That's good since it keeps you on target instead of jumping into your face. Overall it feels pretty good in my hand and I'm pleased. Things I would have changed: Maybe make the slide metal so it would be more sturdy. I don't think I'll break it but you never know. 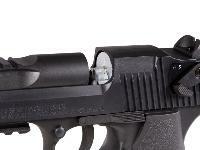 Also a white dot on the front sight would a nice touch so the front sight is a bit more visible when shooting. Guess What? My slide broke three times under warranty! I liked the gun so much I couldn"t put it down! Especially with a scope on it. Shooting incredible groups at 75 ft! Finally I returned the last one for a refund. So if you're going to shoot it rarely like sipping a fine wine OK, but if you're going to shoot it alot, it will brake slide after slide. I called Umarex about it after returning it to Pyramid Air and they played dumb. They said"Whaaaaaaaaaattttttttt???????" Like it was the first they ever heard of the problem! No honesty there. 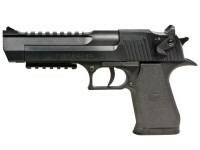 Can I use a 90 Gram CO2 cartridge with the Dessert Eagle Pistol? No, ti can only use a 12 gram Co2 cylinder. 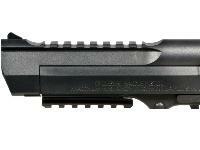 Can the rail under the barrel be removed? Yes it is only held on with 2 screws. pellgunoil looks like Mystery oil ?? Yes it does.But is it? It also looks like automatic transmission oil what your point?